A fab surprise in the central, bustling village of Congresbury, tucked away from the hustle and bustle yet within walking distance to all its amenities. 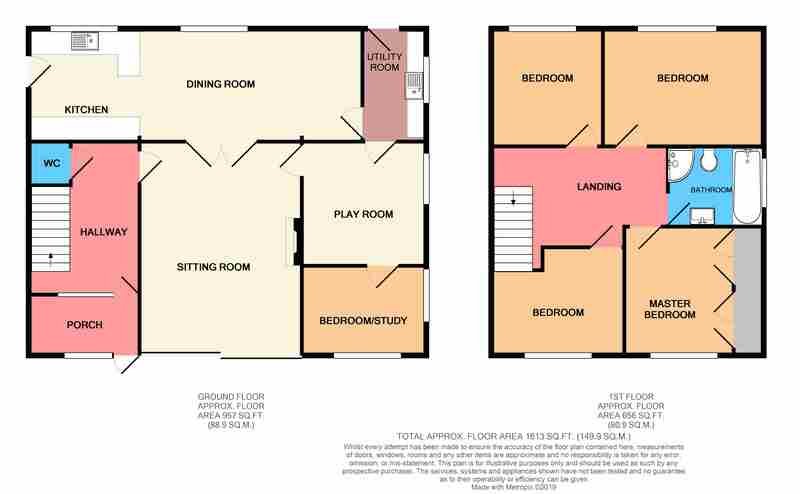 Ideal for a growing family with four/five bedrooms and four reception rooms and wrap around garden, this corner plot is built with space in mind. EPC rating D. DESCRIPTION Lyndale is a generous corner four bedroom property with a garden lovingly wrapped around it, making it one of the most superb detached houses in this area. The current owners have clearly loved living here, pouring their hearts and souls into making this a multi functional family house. Currently comprising sitting room with sliding doors to garden, stunningly decorated downstairs cloakroom, an extensive and impressive kitchen/diner with all the trimmings of a family room, offering space for table and chairs, and for everyone to congregate and socialise. The kitchen itself is quality with high spec base, drawer and wall units, space and plumbing for dishwasher , space for slot in cooker with extractor hood over and loads of storage. There is a separate utility, built with space in mind and taking everything out of the kitchen that does not need to be there plus another door which feels separate from the main house, this leads to two more reception rooms, offering purchasers loads of flexibility, for example one is being used as an office for business from home - but could be another living room, bedroom or play room. Upstairs there are two double bedrooms, master having and array of attractive full length built-in wardrobes and views over the gardens and a further two good size bedrooms. The landing is light and airy, spacious and the owners have just put in a new luxury bathroom with no expense spared. Outside the gardens are a treat being all the way around. Mainly laid to lawn and ideal for the whole family, the rear garden is private and enclosed with sun traps aplenty and even a chicken run for those thinking about having some daily free range, fresh eggs. The entire house benefits from double glazing, luxury bathroom and cloakroom, gas fired central heating from Worcester Bosch combi boiler, detached garage and plenty of off road parking. EPC rating D.
DIRECTIONS From our office in Congresbury, head through the village, past the precinct on the right and turn immediately right onto Stonewell Lane, then take the first right into Stonewell Drive, where number Lyndale can be found on the left hand side. OUR VENDOR SAYS The house is light, bright and a very happy house. WE HAVE NOTICED Being in the heart of this bustling village with the Glebe, St Andrews and being in the Churchill catchment this is a house that should be snapped up. With shops around the corner and with bus routes neat by - It's beautifully presented throughout and ready to move into.